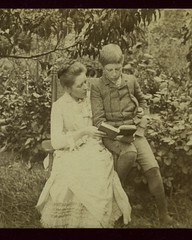 Louise Wrobleski generously donated seven photographs of her women relatives reading books. From these seven and this one of my grandfather being read to by his mother, we have created a set of 8 cards. This set, each card with a different photo, will be sold for $10, for the benefit of the Ulitz Genealogy & History Center. All proceeds will be used to purchase supplies for preservation.